Fisherman's Scrub - TALE: Many fishermen believe that anise oil has the ability to mask the human scent that fish may detect when baiting hooks... 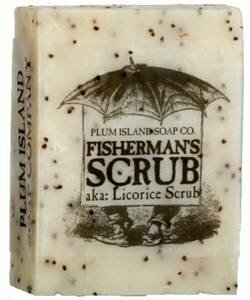 Regardless if you're a fisherman or not this soap bar will probably become your favorite! FACT: This bar is loaded with anise oil and blue poppy seeds and makes a nice scrubby bar. The anise scent of black licorice is sweet and pleasing. Our handmade Soaps are made in small batches in our little factory on Plum Island with high quality vegetable-based ingredients. We use only the finest pure essential oils for scent and natural ingredients for properties and texture. All our bars are creamy in lather pure gentle and wonderfully scented! Available in 8 flavors. Each bar weighs 3.5 oz.